It’s beginning to look a lot like ... orange season! Finally, the fruits on our orange tree, which I dutifully water every other night, are beginning to ripen. Since we’re about to have a surplus of oranges on our hands, I’ve started to plan all of the ways we can put this fruit to use. For starters, a pinch of fresh orange zest tastes delicious in these cookies. 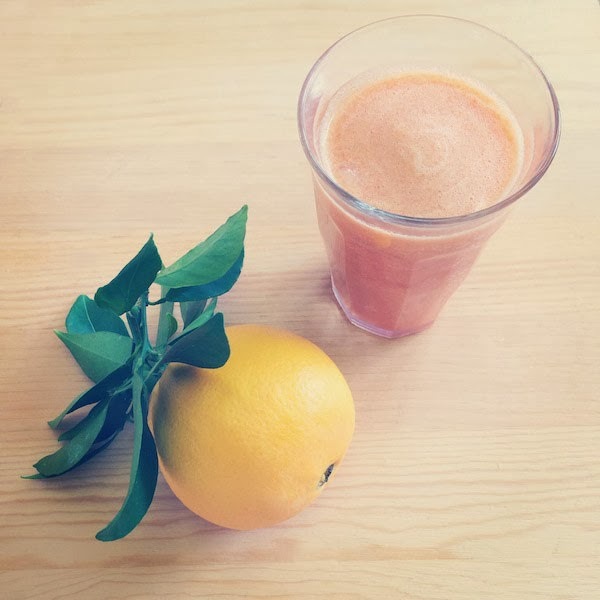 For breakfast, Nick and I are all about green smoothies, but considering the orange situation, I spent the weekend experimenting with citrus-based blends. The results were delicious. This combination of oranges, carrots, peaches, banana and ginger tastes like a tangy Creamsicle, but instead of artificial junk, it’s full of vitamins A and C. Another benefit? It’s orange! If you’re freaked out by green drinks—I’m looking at you, Dad—you can sip to your health in another hue. Place all ingredients in a blender in the order listed and blend until smooth. We recently splurged on an all-powerful Vitamix, which blends this up beautifully, but a regular blender should work, too. Marmalade is a good way to get rid of oranges too. Makes a great hostess gift! Used to do it with the oranges from my backyard when I was a kid. What a great idea! Thanks so much, Whitney! I remember how bad I used to feel before adding green drinks in my diet. I had undeniably let my health slip and my daily carbs definitely got the best of me.